Mayor Rahm Emanuel, Chicago Park District Commissioner Juan Salgado, and Chicago Department of Transportation (CDOT) Commissioner Rebekah Scheinfeld broke ground on the Fullerton Revetment project, which will stabilize the shoreline near the Fullerton Theater on the Lake and create 5.8 acres of new Park District land. 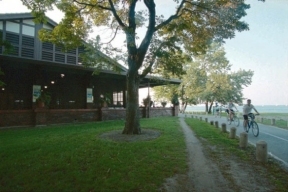 As part of the Chicago Shoreline Protection Project, the City, in partnership with the Chicago Park District and the U.S. Army Corps of Engineers, will stabilize the shoreline at the Fullerton Avenue Beach, which will make the Theater on the Lake facility even more convenient and attractive to residents who would like to enjoy activities at the facility and on the lakefront. The total project cost is $31.5 million, consisting of funding from the Army Corps, the City of Chicago and the Park District. Construction is scheduled to be complete by the summer of 2016. Theater on the Lake will continue to perform in neighborhood parks as part of Mayor Emanuel’s Night Out in the Parks until the conversion is complete.